Having a well-trained dog that is happy and balanced is more than just feeding them and showering them with love. That’s the easy part. However, dogs, just like children, need guidance, discipline and rewards to make them well-behaved and balanced. In this article, you’ll be given 4 tips that you can use to keep your dog well-trained and happy at the same time. It’s really not that difficult. It’ll require some patience on your part, but once you’ve gotten over the initial hurdles, you’ll have a wonderful companion who behaves and responds well. Dogs have evolved to follow pack leadership. When you own the dog, you need to lead it and not the other way around. It’s common to see people who bring their dogs out for a walk and the dog ends up pulling the leash and dragging the owner forward. This is wrong. You must always establish yourself as the pack leader. When your dog does well, you need to reward it. When it performs poorly, you need to discipline or correct it. You cannot plead or reason with a dog because it is driven by instincts and not intellect. You shouldn’t be an emotional mess or highly aggravated either. You want to be cool, collected and yet, assertive. Remember, you’re the pack leader. Don’t let your dog see you sweat. 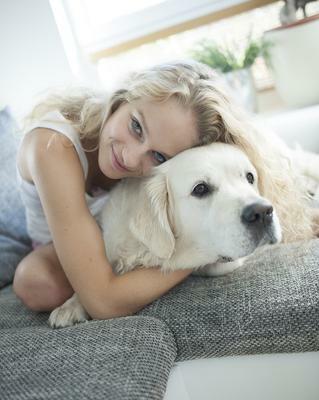 You may have noticed that some dog owners have pleasant, happy dogs, while other dog owners have dogs that growl, bite or are constantly ill-tempered. There’s a reason for this. Your dog feeds off your energy. Usually, the dog’s behavior is a reflection of the owner’s state of mind and energy. If you want your pet to be happy, well-behaved and a joy to have around, you need to display your best behavior around your dog. Being calm, pleasant and assertive will get the job done. Avoid being aggressive, anxious, overexcited, nervous, etc. Remember, you dog will mirror your emotional state. Different dogs have different temperaments and natural instincts. Some dogs love to hunt. Some are more sociable, while some love to run in open spaces. You’ll need to read up on the breed of dog that you have. The more purebred it is, the stronger the instincts and breed characteristic it will display. If you have a dog that needs lots of exercise, you’ll need to bring it out to run and play. If you don’t, it will be unhappy and misbehave because it’s not able to follow its natural instincts. Understand your dog and allow it to follow its instincts. This is one of the most important tasks that you must do to raise a well-balanced dog. When you bring your dog out for a walk, it should always walk beside you – not ahead of you, and not behind you. If your dog tries to walk ahead, stop where you are and don’t take another step, until it returns to your side. When you go back home, make sure you enter the house first, then allow it inside. Bringing your dog for walks (twice a day is ideal) is important because the dog will have a chance to use up its excess energy. A dog that gets enough exercise is a happy, healthy and well-balanced one. Observe these 4 tips and your dog will be much happier and more disciplined. There are many other tips that can help you in this matter. You’ll just need to do your research online and see what works for you and your pet. Housetraining a dog can be a tiresome task that really tests your patience if you don’t know how to go about it. You’ll need to use the right commands, positive reinforcements as rewards, and teach your dog how to alert you when he/she needs to go outside. One point to note is that you should never scold or hit your dog if it makes a mistake. 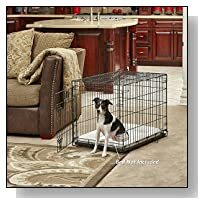 In this article, we’ll look at using crate training as a method to train your dog. This is a very effective method that should be used sparing and wisely. 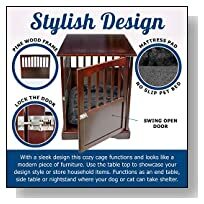 If you get it wrong, your dog will hate the crate and stay away from it. By using crate training, you’re tapping into the dog’s natural instincts to keep its bed clean. 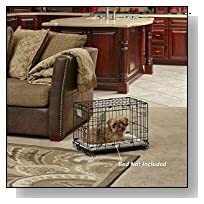 The dog will know that it needs to ‘go potty’ when he /she is out of the crate. 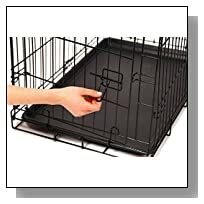 * What type of crate should I buy? Crates come in many shapes, sizes and styles. When choosing one for your puppy, buy one that is big enough to accommodate your dog when it reaches its full size. Small crates will not be comfortable and can get too hot because of the lack of ventilation. 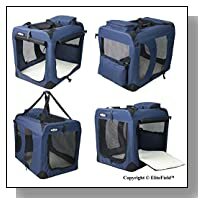 On the other hand, the crate should not be too big because you don’t want your dog to be able to relieve itself in a corner of the crate, and have enough space on the other side to sleep and avoid the mess. The size of the crate should be just right. If it’s too big, you can use a hard-plastic divider to partition the crate so that it’s suitable. 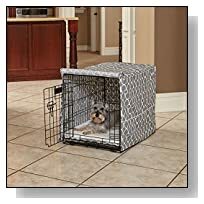 * How do I introduce the crate to my dog? Gradually introduce your puppy to the crate by placing one of it’s favorite toys close to it. You can toss the toy a few times close to the crate and around it. After several such tries, you can toss the toy inside the crate and see if your dog retrieves it. When it does enter the crate, lavish praise and positive reinforcements to encourage him/her. Treat the crate like a cozy cave instead of a prison, and your dog will pick up on your vibes. Once the dog gets used to entering the crate, toss a few doggy treats in the crate and gently close the door while your dog is happily nibbling the treats. Once the dog realizes the crate door is closed, praise him/her and wait about 7 seconds before opening the door. With each session, slowly increase the time where you keep the door closed. The dog needs to get used to it. If your dog barks, do not open the door. This will be reinforcing bad behavior. Only open the door when it’s quiet. 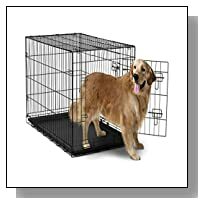 Now that your dog is used to the crate, it’s time to train it. When your dog is a puppy, you can leave him/her in the crate for an hour, and then bring them outside to relieve themselves. Do not shut your dog in a crate for the whole day and night. That’s just cruel and the crate will lose its effectiveness. * How long should it be in the crate? 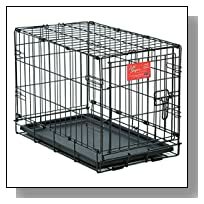 Ideally, your dog should not spend more than 4 hours in the crate during the day. It’s fine to keep them in the crate the entire night while you sleep. However, do ensure that the crate is in the same bedroom with you so that the dog can smell and hear you. This will comfort the dog because it feels close to you. * Why is it relieving itself in the crate? In the beginning, your dog may relieve itself in the crate at night because it doesn’t have the bladder control to last the night. This is normal, and over a few months the dog will develop the ability to control its bladder till it’s out of the crate. After every session in the crate, bring the dog outside to relieve itself. This will teach it to ‘go potty’ when he/she is out of the crate. Do not use the crate as a form of punishment. 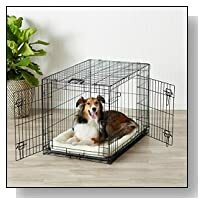 By locking your dog in it, you’ll make it dislike the crate and you’ll face a lot of resistance. Be patient during this training process. You dog will take time to learn. Some breeds learn faster than others and even with the same breed there can be different learning speeds between males and females. As long as you’re consistent and train your dog in the right manner, within a couple of months, it will be housetrained.